Campaign for the American Reader: Pg. 99: Russell Schutt's "Homelessness, Housing, and Mental Illness"
Pg. 99: Russell Schutt's "Homelessness, Housing, and Mental Illness"
Today's feature at the Page 99 Test: Homelessness, Housing, and Mental Illness by Russell K. Schutt with Stephen M. Goldfinger. Humans are social animals and, in general, don’t thrive in isolated environments. Homeless people, many of whom suffer from serious mental illnesses, often live socially isolated on the streets or in shelters. Homelessness, Housing, and Mental Illness describes a carefully designed large-scale study to assess how well these people do when attempts are made to reduce their social isolation and integrate them into the community. Should homeless mentally ill people be provided with the type of housing they want or with what clinicians think they need? Is residential staff necessary? Are roommates advantageous? How is community integration affected by substance abuse, psychiatric diagnoses, and cognitive functioning? 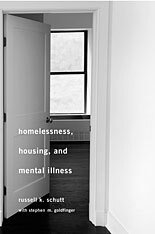 Homelessness, Housing, and Mental Illness answers these questions and reexamines the assumptions behind housing policies that support the preference of most homeless mentally ill people to live alone in independent apartments. The analysis shows that living alone reduces housing retention as well as cognitive functioning, while group homes improve these critical outcomes. Throughout the book, Russell Schutt explores the meaning and value of community for our most fragile citizens.